For a few years in the late aughts, the place to stay during SXSW Interactive was the Hampton Inn at San Jacinto and 2nd. There were 3 main reasons for this: 1) proximity to the Convention Center, 2) free breakfast, and 3) happy hour and a spacious veranda on which to enjoy it. I’m sure a handful of the other nearby hotels offered similar amenities (though perhaps not the veranda), but for whatever reason we all seemed to gravitate to the Hampton. 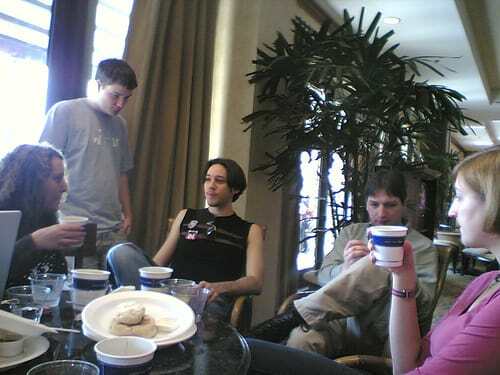 Over the years, I had a the pleasure of meeting and enjoying both company and conversation with dozens of the web’s brightest minds, but my favorite memories from that particular hotel revolved around food. Breakfast was always a big draw and quickly began to take on an almost tailgating-esque significance. We’d meet in the breakfast area, load up on breakfast meats, eggs, and pastries and then compare notes and plan out our day. And if nothing interesting was on deck for a bit, we’d pull out our DSes and engage in some pretty epic races in Mario Kart. Shaun Inman usually won, but Dan Cederholm, Jason Santa Maria, and Rob Weychert were pretty good too. I rarely placed. We didn’t compete for anything but bragging rights. And occasionally bacon. Molly Holzschlag, Faruk Ateş, Jeremy Keith, and Jessica Spengler preparing to take on the day. On particularly awesome Hampton institution was wine & cheese. But before I get into what it was and its significance, let me first talk about its lovely host. When I attended SXSW 2005, I didn’t know anyone. Sure, I followed a bunch of people’s blogs and articles, but I didn’t really know any of them. I went to SXSW hoping to change that and was successful beyond my wildest dreams. One of the most amazing people I met at SXSW has never been a household name even though she was wildly ahead of her time: Jenifer Hanen (or Ms. Jen as she’s affectionately known). When I first saw Me. Jen, I stopped dead in my tracks. The woman who stood before me looked remarkably familiar, but I could not for the life of me figure out why. She looked back at me with what I can only imagine was a perfect mirror of the perplexed expression I was wearing. “I know you. But why?” we asked in near unison. After rooting around in our past lives a bit, we realized that we had met at SXSW nearly a decade earlier when we were both journalists covering the music festival. Not only that, but we had met through a mutual friend… Rey Roldan (a pivotal figure in my first story). Mystery solved, we filled each other in on what we’d been up to since we’d last met and how it was we both had come to work on the web. Ms. Jen was incredibly interested in the future of mobile photography. In 2005, she was running around snapping photos on her Nokia 7610. She was always ahead of the curve, realizing the latent potential of mobile while most of us were still grumbling about IE6. 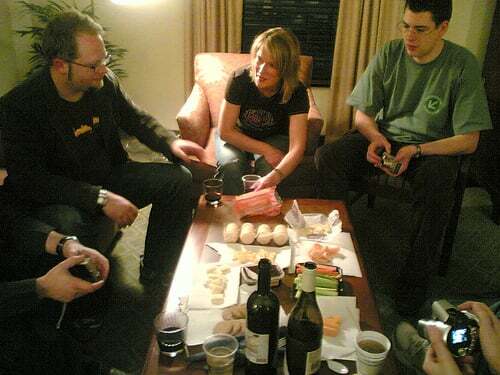 Ms. Jen had been coming to SXSW for quite some time and got to know the staff at the Hampton, who routinely hooked her up with one of the suites meaning she had a couch, a coffee table, and a ’fridge… three important facilities if you plan on hosting a wine & cheese party. Which is exactly what she and some friends decided to do in 2006. Jon Hicks, Veerle Pieters, and Kenneth Himschoot at the inaugural wine & cheese party. When I arrived at the party, I was greeted by Ms. Jen playing the attentive hostess. I was given a glass of wine and plopped myself down on the floor and introduced myself to the little group Jen had gathered. It was a small group, but the conversations were fantastic and I met a number of amazing individuals whose friendships I value tremendously: Kenneth Himschoot, Lauren Isaacson, Chris Mills, Veerle Pieters, Jessica Spengler, and Steph Troeth. Ms. Jen’s wine & cheese parties quickly became a staple of our annual pilgrimage to SXSW Interactive. Each year, more people came until the crowd got so large you literally could not fit another human being in the room. Standing room only… including on top of the bed and some of the other pieces of furniture. The room would be filled with incredible people you wanted to see and interact with, but was also overcrowded and uncomfortable. In a lot of ways, Ms. Jen’s wine & cheese parties were mirroring what was happening with the festival as a whole. But that’s another story for another day.